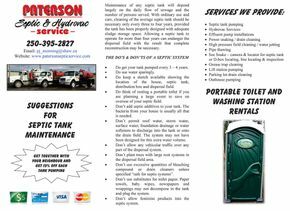 Call Paterson Septic & Hydrovac Service for a quote on pumping your septic tank. Our workers are friendly and knowledgeable, and our pricing is competitive. If you would like to receive a quote or if you have any questions, please feel free to contact us. One convenient way to reach us is by filling out the electronic form located on this page. Once the form has been submitted, we will respond as quickly as possible.